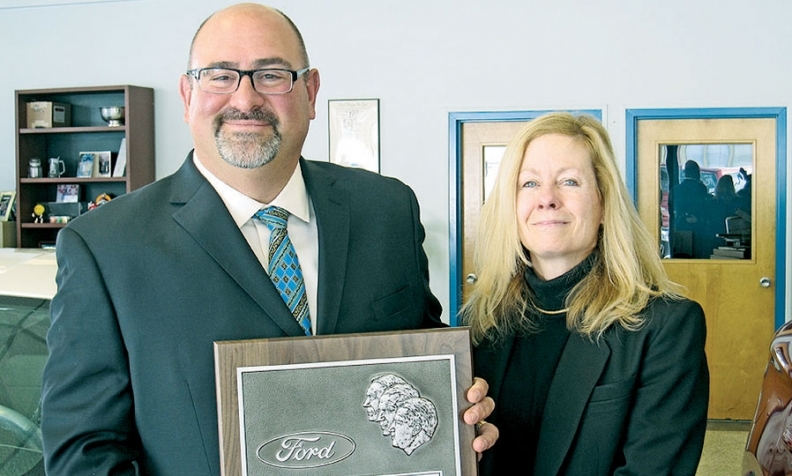 Howard Braunstein, president of M&M Auto Group in Liberty, N.Y., receives a 25-year award for Ford and Lincoln from Wendy Daley, Ford Motor Co.'s East market area market representation manager. The following dealers were honored this year by Northwood University in Midland, Mich., for their contributions to public or private education. Robert Kisselback of Kisselback Ford in St. Cloud, Fla.
James O'Connell of Jim Koons Automotive Cos. in Vienna, Va.
Paul Sabatini of Lincoln of Troy in Troy, Mich.
Joseph Thelen of Thelen Auto Group in Bay City, Mich.
Gregory Timmons of Timmons Volkswagen-Subaru of Long Beach in Long Beach, Calif.
Pieter Zeeuw of Autohaag Zeeuw Group in Delfgauw, Netherlands. Andy Crews, CEO of AutoFair Automotive Group in Manchester, N.H., was named the 2015 Time Dealer of the Year. The program honors new-vehicle dealers for exceptional performance in their dealerships and distinguished community service. It was presented by Time magazine, in partnership with Ally Financial and in cooperation with the National Automobile Dealers Association. 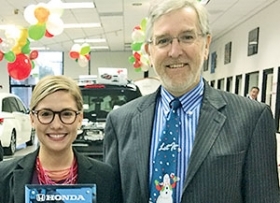 Fifty-five auto dealers were nominated, and Crews was chosen from four finalists. Greg Goodwin, CEO of Kuni Automotive in Vancouver, Wash.
Michael Shannon, president of Holiday Automotive in Fond du Lac, Wis.
Greg York, president of Vann York Auto Group in High Point, N.C.
Peter Hoffman, dealer at Sierra Honda in Monrovia, Calif., receives a 40-year award from Meghan Scott, American Honda Motor Co.'s district sales manager. 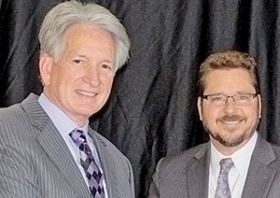 Jeff Crippen, left, dealer principal at Crippen Mazda in Lansing, Mich., received a 25-year award from Tom Brubaker, then Mazda North American Operations' zone sales manager for the Midwest region. 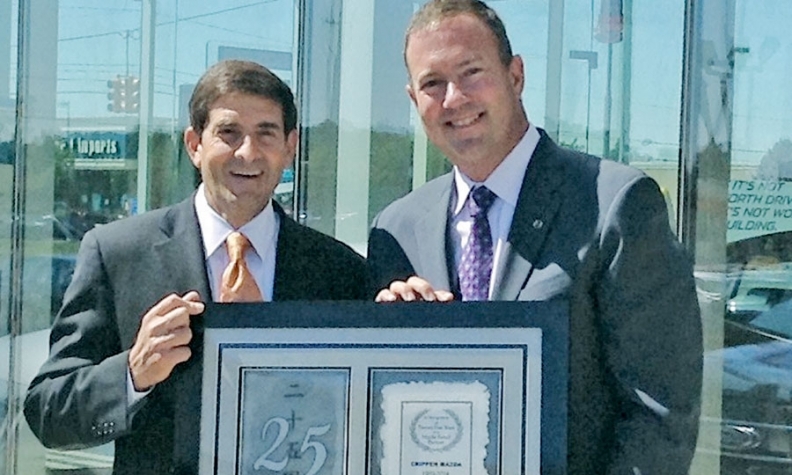 George Grubbs Jr., left, dealer principal at Grubbs Infiniti in Euless, Texas, receives a 25-year award from Eric Anderson, vice president of Infiniti USA's West region. 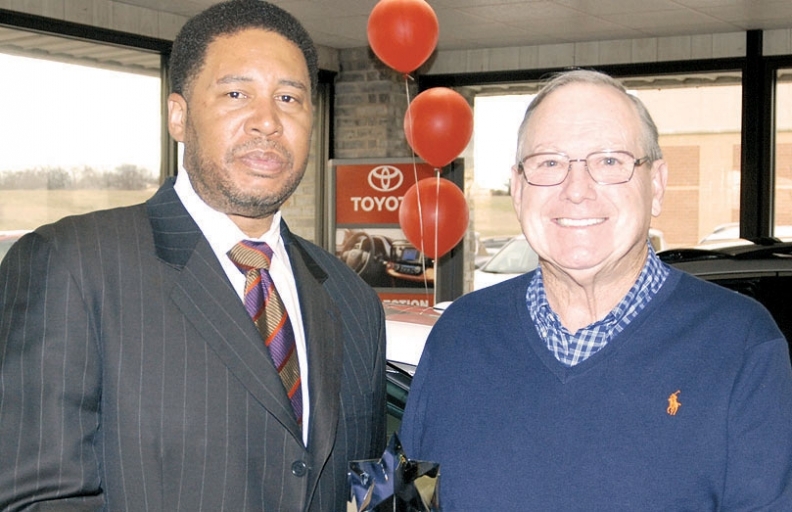 John Morlan, right, dealer principal at Toyota of West Plains in West Plains, Mo., receives a 25-year award from Wylon Harper, assistant general manager of Toyota Motor Sales U.S.A.'s Kansas City region.